Staple in the aspect that when used chronically these ingredients will serve as the backbone to the gains you ultimately attain. The most impressive thing about vitality is the fact that not only is it a staple product designed to be used on a chronic basis, but it is the ultimate pre-workout stacking product as well, designed to enhance your pre-workouts to not the next but the ultimate level. Stacked with Conqu3r users will experience the most superior synergistic stack yet to be seen on the market. We at olympus labs still maintain the philosophy that a pre-workout should be an all in one formula, and ultimately these “pump products” and “stim products” are just a scheme for manufacturers to rake in your money. We perfected Conqu3r by offering it in a “no stim” flavor and made it the most acute acting pre-workout on the market. We took out the chronically used beneficial ingredients in Conqu3r and made the perfect staple product instead, but the true beauty lies in the great synergy formed between the two products. Now users only need 1 pre-workout choice since Conqu3r satisfies all tastes / needs and 1 staple product since Vital1ty is a powerhouse in itself. 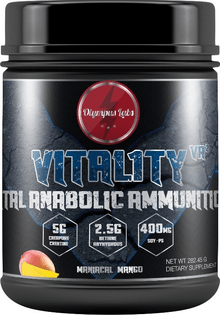 vitali1ty contains strength, testosterone, and lean mass inducing ingredients and enhances memory and overall cognition. This is a fully disclosed product that uses no proprietary blends, ultra concentrates, or cheap marketing tricks. Taking creatine monohydrate on a chronic basis has shown to increase intramuscular creatine, phosphocreatine, skeletal and lean body mass, and muscle fiber size. muscular strength and power will also both increase tremendously by taking creatine monohydrate. Taking creatine monohydrate pre-workout is far more effective than taking creatine monohydrate at periods further away from working out . In 2006, there was a study conducted to test whether the results of taking supplements were greater in periods closer to working out or periods further away from working out. Strength, muscle-fiber hypertrophy and body composition were all tested during a 10 week program. The pre-post group exhibited greater increases in lean body mass and a greater 1 rep max in two of three exercises, ultimately leading researchers to conclude that creatine timing indeed matters and is most beneficial pre and post-workout. Chronic use of betaine dosed at 2.5g per day has been shown to decrease cortisol, increase squat force and increase both growth hormone and igf-1 levels. Betaine increases both force production and muscular endurance in healthy young males. Recent research shows that healthy young males gained 4 pounds of lean muscle mass, increased arm size by 10 percent, and decreased body fat by 7 percent when taking 2.5g of betaine per day for only 6 weeks! Conqu3r includes the full clinical dose. Research shows that when 5mg of bioperine is taken nutrient and ingredient absorption in supplements is increased by at least 30 to 2,000% percent. Phosphatidylserine is an extremely diverse ingredient in the aspect that it has numerous neurological and physiological benefits which include enhanced learning and memory abilities, mood enhancement, and less stress due to its cortisol balancing properties. Phosphatidylserine has been proven to increase brain turnover of norepinephrine, dopamine, and acetylcholine. Combine ps with all the other ingredients in Conqu3r that produce a higher turnover of norepinephrine, dopamine, and acetylcholine and users now have the most comprehensive focus / mood enhancing pre-workout formula on the market. Stacking Vital1ty with Conqu3r pre-workout will provide yet another synergistic effect. Phosphatidylserine found in Vital1ty and caffeine found in Conqu3r were found to decrease post-workout mood disturbance and the perception of post-workout fatigue in users stacking the two ingredients. Vital1ty contains the full 400mg of ps used in a study which resulted in users at the conclusion of the two week study showing a significant decrease in pre-post exercise perception of fatigue and mood disturbance. Phosphatidylserine acts as a cortisol balancing modulator resulting in its users ability and body to handle stress better and giving its user a more productive workout. In a recent study, ps supplementation in golfers showed improved accuracy during tee-off due to ps’s characteristic of cortisol balancing. Combine ps with full doses of L-tryosine (a known dopamine producing agonist), Alpha-GPC (arguably the most superior acetylcholine producing agonist), Huperzine a (another acetylcholine producing agonist), and ACLAR (the final acetylcholine producing agonist in Conqu3r) make stacking Conqu3r with Vital1ty an unparalleled experience in terms of enhanced cognition, memory, and focus producing results. 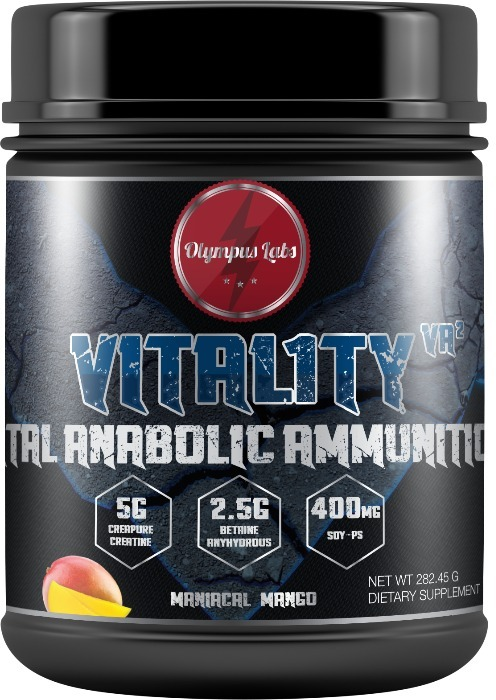 Olympus Labs Vital1ty: Increased cognition, testosterone, growth hormone, Igf-1 levels, lean body mass, and decreased cortisol / bodyfat make Vital1ty an essential staple that should be in every gym goer / bodybuilder’s cabinet to ensure a state of vitality. As a dietary supplement, take (1) scoop 30 minutes prior to workout. On non-workout days take (1) scoop with 8-12 ounces of water. Allergen Warning: Made in a facility that may also process ingredients containing Milk, Egg, Soy, Wheat, Peanuts, Tree Nuts, and Shellfish. NOT FOR USE BY INDIVIDUALS UNDER THE AGE OF 18 YEARS. DO NOT USE IF YOU ARE PREGNANT OR NURSING. Individuals who consume caffeine with this product may experience serious adverse health effects. Individuals who are sensitive to the effects of caffeine should consult a licensed health care professional before consuming this product. In case of accidental overdose, seek professional assistance or contact a poison control center immediately. Avoid alcohol while taking this product. Do not exceed recommended serving. Exceeding recommended serving may cause serious adverse health effects, including heart attack and stroke. Discontinue use and call a physician or licensed qualified health care professional immediately if you experience rapid heart beat, dizziness, severe headache, shortness of breath, or other similar symptoms. Improper use of this product may be hazardous to a person's health. Exceeding recommended serving will not improve results. Consult with your physician before using this product, especially if you are using any prescription or over the counter medication or if you have any pre-existing medical condition including but not limited to: high or low blood pressure, cardiac arrhythmia, stroke, heart, liver, kidney or thyroid disease, seizure disorder, psychiatric disease, diabetes, difficulty urinating due to prostate enlargement or if you are taking a MAOI (Monoamine Oxidase Inhibitor) or any other medication. KEEP OUT OF REACH OF CHILDREN." This isn't your average shaker bottle which bends or becomes unusable after 2-3 uses. Finally a shaker that can be used to enjoy your favorite sports performance beverages with. The bottle plays along the motto of the franchise MBS (Mind Body & Spirit) - a goal for everyone, whether you need it for a protein shake or a fresh juice beverage, you'll absolutely fall in love with the quality of this shaker bottle. -Trademark of a great company and a great you!